Modularity enables New Way Porous Media™ air bearings to provide diverse and versatile solutions for rotary motion applications. There are many ways to create frictionless rotary motion with New Way products, including the use of air bushings, and four different styles of radial air bearings: concave width, concave length, convex width and convex length. You’ll find more specific information about air bushing and radial air bearing applications below. Radial air bearings provide non-contact support for rotating, round artifacts using a thin (5µm) layer of air. This thin air layer is amazingly stiff, creating stable support for a ring, or bearing surface, while allowing for surface speeds of up to 100 meters-per-second. New Way Radial Air Bearings can be configured to ride on the outer diameter or inner diameter of a rotating artifact for a given application, using concave and convex shapes specifically machined to the tight tolerances necessary to create non-contact motion. 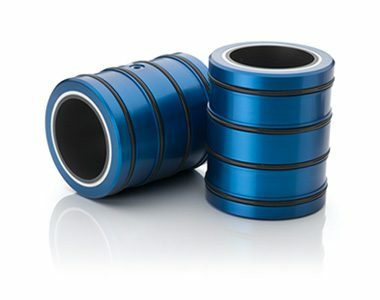 Currently, these bearings can accommodate radius sizes from 6.35mm to 3 meters, as well as any custom diameter in between. The non-contact nature of these radial air bearings necessitate axial constraint for the rotating body as well. This can be accomplished with standard rolling element bearings, but the use of standard, off the shelf New Way flat air bearing components will create a fully-independent artifact rotating in space, for complete isolation from vibration and environmental effects. For precision analysis applications, such as Computed Axial Tomography (CAT scan), the need for high contrast is critical. New Way Porous Media radial air bearings give you high stiffness, repeatability and fast vibration damping. Without the heat build-up and vibration, far greater scanning resolution can be achieved than was previously attainable with roller bearings. Nor is lubrication necessary. Finally, the substantial decrease in friction equates directly to savings in the energy required to turn an artifact, meaning decreased power design needs, and decreased latent heat build up. 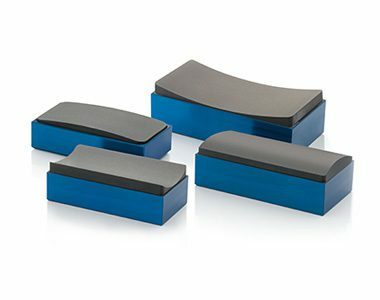 New Way Porous Media air bearings are made using a type of graphite, itself inherently a bearing surface. 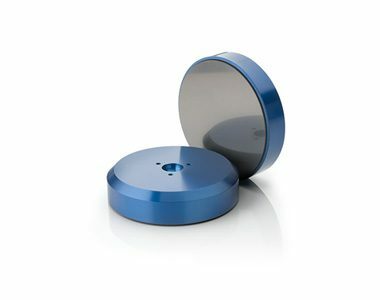 This porous media diffuses the air flow across the entire bearing surface through millions of sub-micron sized holes. In the event of catastrophic air loss, the natural lubricity of the material will slow the rotating artifact gradually, preventing potential damage and ensuring safe operation in patient environments. Further, the air bearings are not damaged from momentary sliding contact, and can be re-used immediately once air is restored. For critical operations, an independent air source can be configured for use in primary air loss situations. New Way air bushings are, essentially, a tube of porous media. Applying an air pressure of 60PSI (0.4 MPA) creates an 8 µm (0.0004″) layer of air between the air bushing and a shaft. The bushing is designed so that a self-centering force is created by the air flow, allowing for true 360° non-contact motion on round shafting. The paralleling force over the length of the bushing centers the shaft naturally, creating precise, non-contact motion in one axis. The resulting frictionless motion eliminates the heat and vibration commonly associated with roller contact or re-circulating-ball linear way arrangements. The self-centering force also allows for higher than standard rotational speeds in spindle-type applications with all the benefits mentioned previously.